Your school time it`s over and you enjoy a new life start ! Are you looking for a job or a place for apprenticeship in a exciting and dynamic place ? The logistic and spedition industry is the connection between production, trade and clients. This, extends to all industries and countries. Activities are suitably varied. 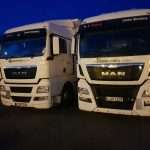 Maiortrans GmbH is a logistic and spedition company, and logistic supplier in Sudbaden – Herbolzheim, and also in Bayern – Nurnberg. We value qualification and apprenticeship of our over 120 employeers. Are you excited, ready and eager to learn ? At Maiortrans GmbH, you will be involved from the first day and you will actively contribute to our work, and also you will have a important role in our team. So, you will not only know the processes but also you will help model them. Promoting young talented employeers is very important to us. Next to practical training, we also help our apprentice in theoretical training for their exams. Allow yourself to be inspired by our business and to be informed about all your opportunities at Maiortrans GmbH.